How quickly 12 days can fly when you are traveling. I started my journey to Nicaragua on February 27th with a 1 page agenda and only a slight clue of what to expect. The following twelve days would prove to be extremely impactful and have already begun to shape how I see social enterprise as well as my future. The farm was stunningly beautiful and I was immediately filled with energy and excitement at what was to come. During the first day we were taken on a tour of Finca El Peten, one of the coffee farms that participates in Social Enterprise at Goizueta’s (SE@G) Farmers to 40 project. On this tour I learned all about the process of planting, growing, and milling coffee beans from start to finish. I had so many questions and I took in so much information about what happens on the other side of coffee before it gets to a roaster. I was fascinated by how many variables there are in producing high quality coffee and it gave me a new found appreciation for the work that goes into making a great cup for me to enjoy. That afternoon, we went into a nearby village to help lay a concrete floor for a local family of four (1 mother and 3 children). We mixed the concrete with sand and water and helped to move the mixture to the bedroom of the home which would be laid by a local mason. We worked for 3 straight hours in the house, but we finally finished the work and left the family with a new floor to help improve their health. We learned that many children get sick because of the dirt floors and easy access of bugs to bite them while they sleep. The family was extremely appreciative and we were glad to help out. After that we returned to the farm for dinner and then turned in for the night. The following day we made a trip up to another coffee farm called Los Pinos. 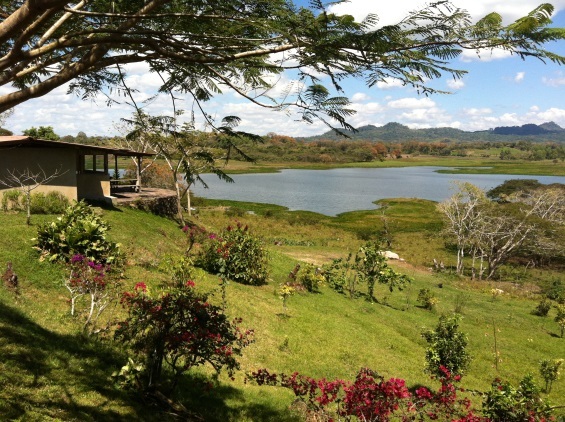 This farm was run by one of the most well-­‐known coffee farmers in the whole region. His name was Byron and he gave us a tour of his farm as well. He explained to us the importance of taking care of the land and living in harmony with nature and not “poisoning” it with pesticides and hormones. He not only produces coffee on his farm, but he also grows all kinds of fruits, herbs, and vegetables, and raises farm animals. He challenged each of us to rethink how we buy our own food and to be considerate of where it comes from rather than just considering what it costs. He is hopeful to restore balance to his environment by utilizing the land he has in a natural and environmentally friendly way. After leaving the coffee farms, we proceeded to visit a series of social enterprises in both Nicaragua and Costa Rica. For the rest of our time in Nicaragua, we visited Hotel Con Corazon, which is a social enterprise that reinvests 100% of its profits into educational programs for local children. They have made huge impacts in keeping kids in school by offering exciting programs after school that encourage the local children to learn and apply their knowledge of basic subjects. Their work is improving the dropout rate so that children are no longer leaving middle school, which is the prime time for students to dropout. Their impact is being felt now to the point where they now need to build another high school because of the increase in children graduating from middle school. We also visited Café Sonrisas which employs only people who are mute and deaf. The owner is determined to show his community that they are just as capable of being productive in society and they deserve equal opportunity. Finally, we visited Communidad Connect which is an organization that seeks to empower the local community by providing better access to healthcare through local clinics, positive alternatives to young men through a local basketball league, business opportunities through partnerships with women’s cooperatives who make various handmade goods to be sold in the city, and an afterschool program for local kids to learn English and play sports. To provide some excitement for the kids in the afterschool program, we provided our knowledge of other languages, besides Spanish and English, to the children. We taught each of them key phrases in Italian, Japanese, Mandarin, French, and an African language native to Benin. The kids loved it and marveled at how some of the languages were so different from their own native tongue, while others were very similar. After saying goodbye to Nicaragua, we said hello to Costa Rica. Immediately, I could see the difference between the two countries. Nicaragua was to Costa Rica as Mexico is to the United States. Costa Rica was more developed from an infrastructure standpoint and the people had entirely different concerns. Where politics and taxes were the primary concerns in Costa Rica, teen pregnancy and making ends meet were the primary concerns in Nicaragua. Additionally, the standard of living seemed to be much higher in Costa Rica as well as the opportunities available. and had lent out over $500,000 USD after only 3 years of operation! FINCA works with all kinds of local businesses and is helping to establish a stable economy within the rural area. The owners are from the city they currently work in and they are deeply committed to the people in their community to see them become financially independent and prosperous through small business. Finally, we finished off our trip by visiting the largest children’s hospital in Costa Rica. We learned that healthcare in Costa Rica is completely free and available to anyone in the country. We were able to see the various offerings within the hospital from the NICU, to a cancer treatment area, as well as a trauma room for more immediate surgeries. The healthcare they provide to patients is outstanding. The mortality rate among infants was less than 1% which is the lowest among all Central American countries. Overall, having the opportunity to visit Nicaragua and Costa Rica has expanded my view of business and the world. From the perspective of the world, I was able to practice my Spanish and appreciate another culture different from my own. I learned about the history of both Nicaragua and Costa Rica and gained an appreciation for the formation of each country and the uniqueness of the cultures. From a business perspective, I was able to see micro-­‐businesses and cooperatives making a difference in the local economies. Whether it was a local coffee farm, souvenir shop, non-­‐profit, hospital, or micro-­‐finance institution, business owners are working with local people to pour back into the economy. I was inspired to see myself as a future business owner who could easily make the same impact through similar means. I plan to keep in touch with some of the coffee farmers I connected with and I have already discussed with my wife ways for us to take a visit together to see the coffee farms and form partnerships to help build the economy. Without your support, I never would have been able to have this experience.